Have you ever picked up a textbook and started reading, only to realize after a time that none of the information is sinking in? If so, then the SQ3R Reading Method might be able to help. The SQ3R Reading Method is a technique aimed at improving the way we read and then understand an academic text. The model first came to light in 1946 in a book by Frances P. Robinson called Effective Study. Understand the information that you’re reading. Retain the information you’re read. Many of us spend years studying through school and university but never learn an effective and efficient way to study textbooks. While the five SQ3R Reading Method will take time to master they will help you to become a more efficient and effective reader. SQ3R stands for Survey, Question, Read, Recite, and Review. It’s obviously impossible to read a whole textbook in a single sitting, so apply the SQ3R process to manageable chunks of text, such as by tackling a chapter at a time. The first step of the SQ3R model is to survey the text you’re about to read. Essentially, you skim the chapter or chunk of text you want to study. Look at headings and subheadings. Examine images, charts, and diagrams, reading any text associated with them. Read any introductions or summaries within the text. If there are review questions or an associated study guides then read these too. The aim of this step is to get a general idea of what you’re about to read. Completing this section will typically take about 10 minutes. In this step of the SQ3R model, you formulate questions which will help you to read with purpose during the next step. To complete this step turn each heading or subheading into a question using the words: who, what, how, why, or when. You don’t have to write down these questions but some people find it useful to do so. Note that this is known as SQW3R. 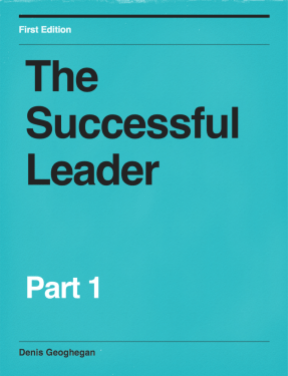 Read each section with the aim of answering the question you asked in step two. Take your time while reading. The purpose is to understand. Reread anything that you don’t fully understand the first time around. In this step, you recite in your own words the answers to each question you asked in step two, without looking at the text. This is one of the rare occasions in life where it is not only okay but actively encouraged that you talk to yourself! Saying the answers to your questions out loud helps begin the process of moving the information from short-term to long-term memory. Going through this step will also help you think about if you’ve really understood what you’ve just read. It can be a good idea to make notes of your answers to questions, for when you need to study it again. Write down your answers in your own words. By using your own words you make it more likely you’ll remember the information later. To review, cover your answers and ask yourself each question in turn. If you can’t answer the question, examine your notes and then have another try. The review step helps you to remember information for the long-term. The review step is an ongoing process. It can be a good idea to review your answers one day after completing the first four steps, and then periodically from time to time after that. Sometimes, when we come back to review our notes after a period of time certain things may no longer make sense. In this case, update your notes as needed. Many people spend years studying but never learn effective ways to study. 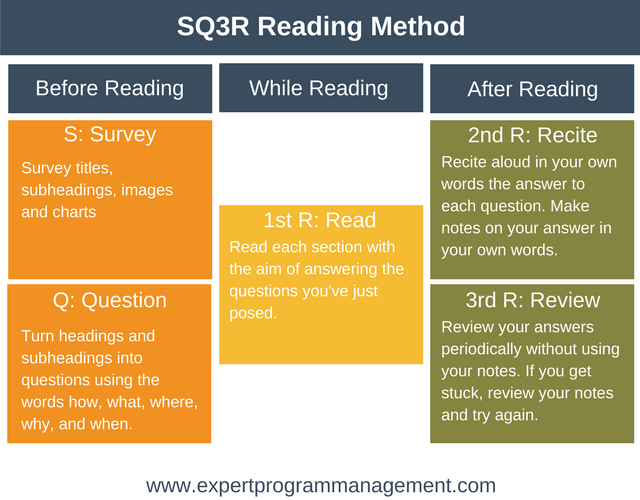 The SQ3R Reading Method is designed to help you read in a more effective and efficient manner. The focus of the method is on active reading, whereby you’re trying to answer questions as you read. Doing this improves your comprehension of the text. Later, you write down and recite your answers in your own words to help you commit them to long-term memory.